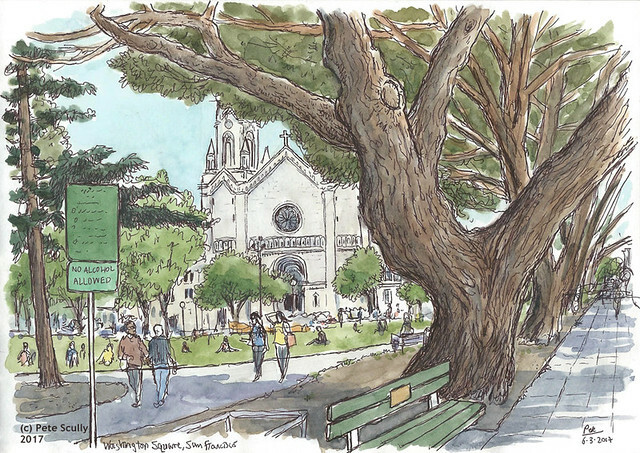 This is Washington Square, in San Francisco’s North Beach, sketched on a warm Saturday afternoon at the start of June. 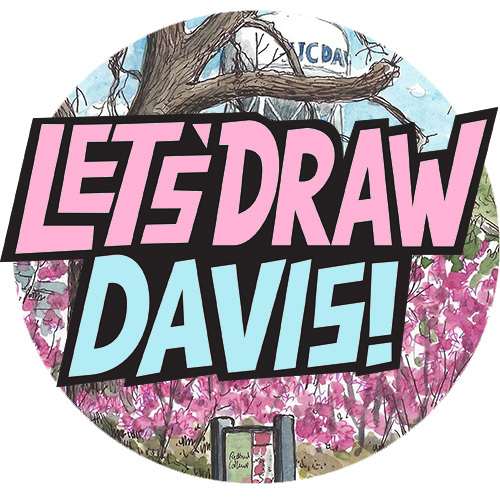 Last month I led an urban sketchers workshop as part of their “10×10” series, more specifically the series organized by Urban Sketchers East Bay. 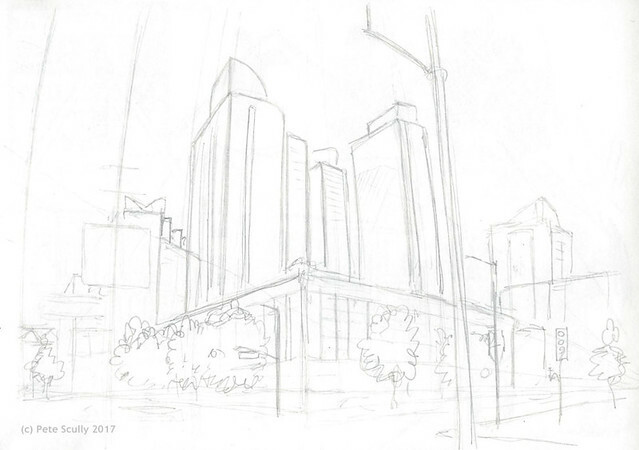 My workshop was called “Perspectives of San Francisco”, and was of course all about perspective, specifically how to use it when sketching tricky subjects like cities with hills. It went very well, and I hope that I got some of my ideas across. I drew on the many things I have learned over the years (and continue to learn) from perspective experts I have met over the years with Urban Sketchers. It was a workshop of about three hours, and North Beach really is a great place to practice your sketching. When it was all done I drew a scene of Washington Square (above) before heading home. 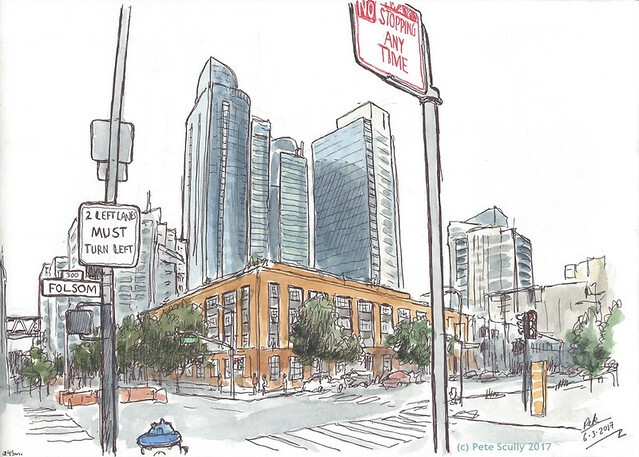 In the morning when I got to the City however I did do a couple of practice sketches not far from the Amtrak bus station, in SoMa. The scene below is of some of the modern buildings that have sprouted up South of Market. I drew it in pencil in about 5-10 minutes, to show the basics, before drawing it again (different page) in pen and watercolour in about 40-45 minutes. While I sketched a woman asked if I was lost. “No,” I said distractedly (I was looking up at the sky with a sketchbook under my chin). “Are you British? Welsh, Scottish, Irish?” she then asked. How you can tell all of that from one mumbled two-letter word surprised me a lot and I didn’t know how to answer except, “oh, um, er” and she said, “ok” and walked off. Very odd. I suppose answering “oh, um, er” to a perfect stranger in the street and looking aghast and confused is pretty much the most British thing you can do, but you see within that question there are a whole number of possibilities which don’t add up to quite the same thing, but may need explaining, which while in the middle of a sketch I really didn’t have time to get in to. British yes, Scottish no, Welsh no, English, well from England so yes but identify as Irish through family, British is easier, European too yes, for now, I suppose I’m Californian these days, but not an official American, what is identity anyway, look it’s confusing. I’m Pete, I come from Burnt Oak, I draw pictures of things and really like Spurs and Lego, that’s where I’m from. So yes, “oh, um, er” is a good description of my identity. See the top of the fire hydrant poking into this drawing. That’s you, that is. Hahahaha that’s such a British reply followed by the angst 😂 Terrific drawings as always. When I visit the USA, people keep me talking to hear my accent.